Energy conservation, green building, and building science. Upgrading an existing solar hot water system. 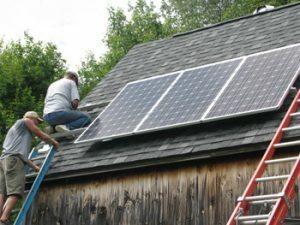 How do you install a small off-grid solar system? Come join us and learn the fundamentals of how solar works for numerous applications (and how the world can shift to renewables and fully phase out non-renewable energy!). Learn about various codes and technologies involved in designing and creating energy efficient, Green houses and buildings. We will discuss the “tiny house” craze and demonstrate “tiny power”, small, solar units that can be used for portable and tiny home power needs. Overview of the International green building movement, LEED, Build-it-Green, detailed tour of farm house renovations, solar and renewable energy, what you can do when you get home after the workshops.